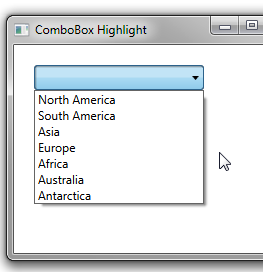 By default, when you have a ComboBox open in WPF, a highlight is shown as you hover over different items in the ComboBox. 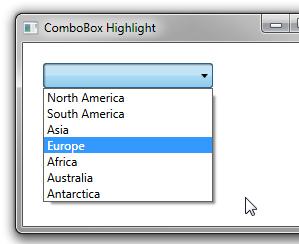 The last item that you hovered over with the mouse will remain selected even if you move the mouse off of the ComboBox. If you’d rather have an item selected in the ComboBox only when you hover over it, you can modify the ItemContainerStyle for the ComboBox. You can use Blend to make a copy of the existing template and then make changes to the copy. 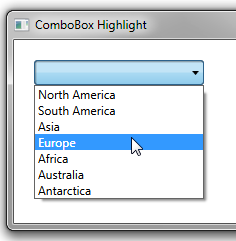 In the template, you’ll find a trigger that sets the background of the ComboBoxItem when the IsHighlighted property is true. You can change this to a MultiTrigger that also checks IsMouseOver.